It was very easy to order online and the turn around time was less than a day! Very happy with the collar! I've been putting an ASAT (like texturized fake leather similar to biothane) police lead, 3/4 inches wide,through the paces this week. It is a strong lead and does not stretch at all which is nice when you are dealing with a drivey perpetual puller. However... and this is a BIG HUGE however, ASAT is ridiculously slippery when you get saliva on it. People who train with food will appreciate this warning. ASAT is too slippery to be safe for my purposes, IMO. Dry, it is awesome. Soft, flexible and strong. Wet is is slick but manageable. Slobber and you really have to be super deliberate in how you hold the lead, fold it and squeeze it crazy tightly. Not a joke. Be careful. lilangel wrote: I've been putting an ASAT (like texturized fake leather similar to biothane) police lead, 3/4 inches wide,through the paces this week. It is a strong lead and does not stretch at all which is nice when you are dealing with a drivey perpetual puller. However... and this is a BIG HUGE however, ASAT is ridiculously slippery when you get saliva on it. People who train with food will appreciate this warning. ASAT is too slippery to be safe for my purposes, IMO. Dry, it is awesome. Soft, flexible and strong. Wet is is slick but manageable. Slobber and you really have to be super deliberate in how you hold the lead, fold it and squeeze it crazy tightly. Not a joke. Be careful. ASAT REVISED! I changed my mind. Ok... so I discovered the thing about ASAT is that it must come from the factory or whatever with some kind of lube on it. Rubber molds need lube to release the rubber when it is done baking. Some of that lube must stay on the ASAT even after it sells and is used. It rained all day today and I was dropping the ASAT lead in mud puddles and stepping on it while working dogs and after a few times in the mud, I dunked it in a puddle to wash it off and it was pretty gritty and whatnot. I was rubbing the lead with bits of sand between my fingers a lot today because it seemed like the more I rubbed it the more grippy it got! After that scrubbing form the mud and sand, the ASAT was actually really nice to work with. I even used it with greasy, slobbery hands from using a chopped up treat roll and the ASAT was still pretty easy to grip. I was trying to make it slippery and was not very successful. It is no longer greasy feeling, even when wet and slobbery. It is actually nice to use in wet conditions. Without slobber it is actually quite tacky when wet. Just make sure you scrub it for a while or kick it around in the sand and water before you use it. After a while it gets tacky. I bet using something like the orange degreasers with the pumice in it you get at autozone would work well to get the lead grippy. lilangel wrote: ASAT REVISED! I changed my mind. Just finished an Appointment with a new client who came with a chain leash. I had the ASAT in the car so we used my leash for obvious reasons. So she doesnt disclose in any previous interviews or discussions that doggy is a habitual leash fighter. Sigh. Anyways, half way through working on some leash skills And realistic ob, doggy goes for the leash and is having a blast chewing and tugging. Well practiced. Leash does not stand up well to being bitten. I will be throwing it away actually. And it was very slippery. Sorry to get any hopes up. Not anywhere near a rushed as leather or even nylon. Doggy progressed nicely for one session. Too late for the lead though. 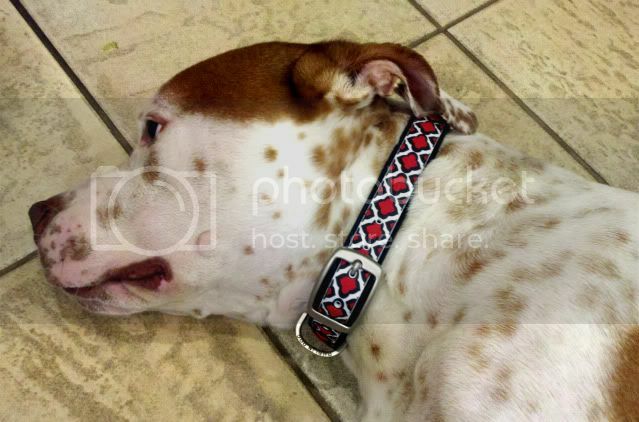 lilangel wrote: Gotta give a big plug and shout out to Cali Girl Collars. Roe is awesome and her collars are very nice. If there is a problem with the hardware she fixes it, period. Well worth the money. No regrets. Will buy from Roe again with no hesitation!! ^ Thank you for the Ruff Wear link! I was going to ask where is a good place to look at getting a backpack, etc. As for treats, food, essentials, I use Chewy.com! Best prices I can find, and great customer service. A little slow on the shipping. Anyone find anything better than Chewy?